Soca Monarch 2013 Semi Finalists announced - No Kes! What of Machel in finals? 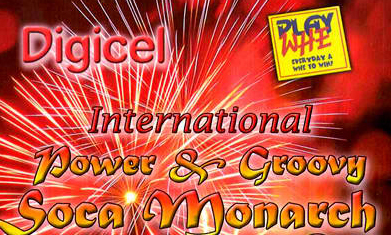 Thanks to the Trinidad Guardian Site we have the list of the Semi Finalists for both the Digicel International Groovy Soca Monarch and the Play Whe International Power Soca Monarch competitions for 2013. Noticeably absent from the line-up is former Groovy Monarch, Kes. Now, as the reigning champion in both the Power and Groovy categories, Machel Montano should be automatically in the finals, but we'll wait on an official announcement before we are certain. Changes to this year's Soca Monarch rules no longer allow anyone competing on 'Fantastic Friday' from performing at any other event on that Friday night into Saturday morning without facing a 'a significant penalty'. Machel also awaits sentencing, set for Jan 17th, after being found guilty last month on 5 criminal charges. How these circumstances affect the Soca superstar remain to be seen. Machel did reassure fans however that he would be present for all 2013 Carnival engagements at the 'Savage Saturday' fete in Chaguaramas last weekend. Also of note, crowd favourite and another former Power Soca Monarch, Bunji Garlin is absent from the Power category, but look for him as a front runner in the Groovy Soca category with his smash 'Differentology'. The semi finals will be happening on January 20 at the Arima Velodrome in Trinidad and has a fantastic lineup with 30 competitors in each category. Just who will be present in the finals? We'll all just have to wait and see.